"Baby can help Squirty Crab find Squishy Fish " It's an adventure in bath-time fun in one more bath book that features colorful, friendly toy animals made of floatable and waterproof vinyl. The bright, waterproof storybook tells how Squirty Crab meets different aquatic animals in his search through the pool for his friend Squishy Fish. The first fish he meets comes out of a pocket on its vinyl page, but it isn't Squishy--it's Shiny Fish Next, Squirty looks under a rock and meets Sticky Starfish. Again, Baby can remove the floatable starfish from a pocket on its page. At last, Squirty finds Squishy Fish, hiding in his own pocket. 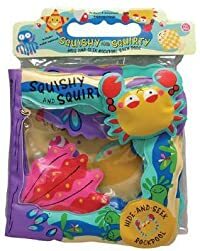 Squeezable Squishy has a nozzle that Baby can fill with bath water and squirt at the other toy animals. Here's a delightful picture book with bath-time toys that will keep Baby company both in and out of the tub.